CarGurus has 28,542 nationwide Soul listings starting at $2,799. The Kia Soul compact crossover vehicle receives a number of new features and updates for 2012, as well as transmission and engine tweaks that help push fuel economy up to 35 mpg. The 2012 Soul's exterior design remains a little too funky for a few critics, and some find the Soul's ride too harsh. The Kia Soul remains a people pleaser for 2012, as it's hard to find anyone with something negative to say about the vehicle. The Soul seems to do it all well. It delivers winning performance and handling, good fuel economy, copious amounts of space, decent headroom and legroom, a wide range of tech features and good overall value. Problems with noise and vibration were addressed for 2012, quelling key complaints from previous years. Some critics take issue with the Soul's unique exterior design, but overall the Soul delivers on all fronts. Now in its third year of production, the Kia Soul crossover vehicle receives a mid-generation refresh for 2012. Outside, the Soul continues to display its unique exterior design, highlighted by a rounded nose, chrome-accented grille, wedge-shaped lines and boxy rear end, all of which help it stand out from the crowd. However, Kia made a few subtle exterior changes for 2012 in an effort to streamline the Soul's look. Updates include a redesigned hood and new front and rear bumpers, as well as new headlights, taillights, side mirrors and wheels, plus a new Moss exterior color. Kia offers the 2012 Soul in Base, Soul + (plus) and Soul ! (exclaim) trim levels, as well as in a special Red Rock edition, which comes equipped with heated front seats, push-button start, brown cloth upholstery with black leather trim and a unique Canyon exterior color. For 2012, the top-of-the-line ! trim receives a new Infinity audio system, which is also available in the +. The ! also gets a new voice-activated infotainment system with a 4.3-inch color touchscreen and rear camera display. Outside, the ! displays a few unique features, including new projector headlights, front LED accent lights and LED taillights. In addition, Kia offers a new optional Premium Package for the !, which includes heated front seats, leather upholstery, automatic climate control, push-button start and a navigation system. Responding to complaints about interior noise levels, Kia also upgraded the Soul's sound insulation and vibration-reduction components for 2012. Thanks to its unique design and ample cargo space, the 5-door, 5-passenger Kia Soul has carved out a niche for itself in the competitive compact automotive segment by appealing to younger buyers and young families. It may not offer the sporty handling of such vehicles as the MINI Cooper, Honda Fit, Mazda3 and Volkswagen Golf, but it runs competitively against other vehicles in the class, including the Scion xB, Hyundai Accent, Nissan Cube and Toyota Matrix. Since its introduction for the 2010 model year, the Kia Soul has garnered a number of awards. 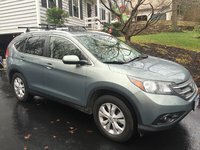 It was named a Best Buy by Consumer Reports in its first year, as well as one of the Best Family Cars for 2010 by Parents Magazine, and it was designated as a Top Recommended Vehicle for 2011 by Edmunds. AutoWeek listed the Soul as one of 10 Safe Rides for Teens, and Time Magazine called it one of the Most Exciting Cars of 2010. The Soul has also received various awards from Kelley Blue Book, Popular Mechanics and WardsAuto, and it even received an award from PETA for its animal-friendly commercials featuring hamsters. The Soul gets a power boost for 2012, thanks to two upgraded powerplants. 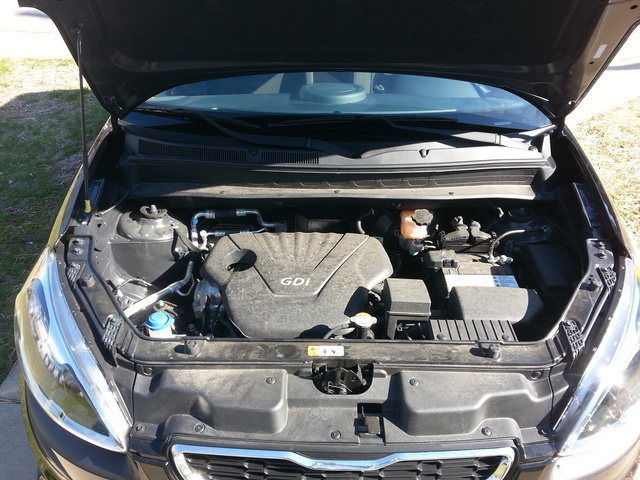 A 1.6-liter 4-cylinder GDI engine, which drives the Base trim, now delivers 138 hp, up from 122 hp the previous year. Torque jumps as well, from 115 to 123 lb-ft. At the same time, fuel economy numbers for the updated engine increase by 4 mpg, to 27/35 mpg. The Base trim comes standard with a 6-speed manual transmission, although owners can add an available 6-speed automatic transmission with overdrive. 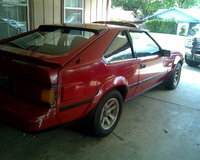 Both transmissions were updated for 2012 to help increase fuel economy. The + and ! trims get an upgraded 2.0-liter 4-cylinder engine, which now generates 164 hp and 148 lb-ft of torque, up from 142 hp and 137 lb-ft of torque. In the + trim, the engine is paired with the 6-speed manual transmission, which comes standard, or the optional 6-speed automatic. The ! comes equipped only with the 6-speed automatic. Both transmissions were updated for 2012 to make them more efficient in an effort to improve fuel economy. Despite the increase in horsepower, the larger engine still manages decent fuel economy numbers of 26/34 mpg with either transmission. Given the small difference in fuel economy, the 2.0-liter engine in the upper-level Soul trims offers a better choice for buyers, testers say. Still, they note that both engines provide plenty of power under the pedal, delivering good performance around town and at highway speeds. However, reviewers have mixed opinions about the new transmissions. While the manual shifts smoothly, it doesn't necessarily deliver a sportier ride, reviewers note, and some complain about shift points in the automatic transmission, which defaults toward fuel economy rather than quick, sporty driving. Of course, many owners probably prefer it that way, making the Soul a capable yet efficient ride around town and on longer trips. The Kia Soul sits on a front-wheel-drive platform designed for both stability and ride comfort. With its tall height, the Soul does exhibit some body lean in corners, but testers say it's not unreasonable for vehicles of its design and class. The Soul also delivers relatively nimble handling, thanks to its fully independent suspension, with MacPherson struts, coil springs, gas shock absorbers and a stabilizer bar in the front, and a torsion beam axle with trailing arms, coil springs and gas shock absorbers in the rear. The electric rack-and-pinion steering feels a little light, according to some testers, but overall it receives no complaints. Hydraulic power-assisted antilock brakes provide good stopping power at all speeds. In previous years, the Soul received a number of complaints about noise intrusion and vibration, which affected the ride for some passengers. The automaker responded by making a number of upgrades for 2012 designed to provide a quieter, less harsh ride. Updates include an A-pillar noise-absorber pad, vinyl sealing on door trim, a thicker dash insulation panel and a floor-mounted anti-vibration pad, as well as an exhaust silencer. As a result, testers have noted a significant reduction in noise and vibration. The Soul receives new wheels for 2012. The Base comes equipped with 15-inch steel wheels, while the + gets 16-inch alloy wheels. The ! receives new 18-inch alloy wheels. Interior upgrades for the 2012 Soul include a new tilt/telescopic steering wheel, which now comes standard in all trims, as well as a new voice-activated infotainment system with a 4.3-inch color touchscreen and rear camera display, which is optional for the + and standard for the !. The ! trim also receives a new 7-speaker, 350-watt Infinity audio system, which is available in the +. Kia also redesigned and upgraded many of the cabin's interior materials to provide a more refined yet still high-tech ambiance. An uncluttered, uniquely designed floating center stack places controls within easy reach of the driver and passenger, and gauges are easy to read. Occupants will find plenty of legroom and headroom throughout cabin, thanks to the Soul's boxy design, and the seats provide plenty of support for long-distance travel. However, the second-row seat might be a tight fit for three large adults. High seating positions provide good visibility out the front, but thick C-pillars can restrict visibility out the rear. Cargo space and interior functionality remain one of the the Soul's strongest selling points. Thanks to a total of 14 storage zones, including a two-tiered illuminated glovebox and storage spaces under the rear floor, passengers will never lack for places to stow their gear. The second row splits 60/40 and folds flat to extend cargo space, which checks in at a generous 19.3 cubic feet with the rear seats up and 53.4 cubic feet with the rear seat folded down. The Soul also excels when it comes to tech features and options. An AM/FM audio system with a CD/MP3 player and SiriusXM radio comes standard in the Base and + trims, while the ! gets the new Infinity system. USB and auxiliary input jacks are located in the center console. The + and ! trims add Bluetooth and a leather-wrapped steering wheel with audio and cruise controls. A Premium Package, available for the ! trim, also adds push-button start and a navigation system with SiriusXM traffic, as well as heated front seats and automatic climate control. Other standard features for the Base trim include air conditioning, an external temperature display and power windows and door locks with illuminated switches, while the + and ! trims add remote keyless entry and separate tweeter speakers. Since its introduction, the Kia Soul has consistently been named a Top Safety Pick by the IIHS, thanks to its top ratings for protecting passengers during frontal, side-impact and rollover crashes. The NHTSA gave the Soul a safety rating of 4 out of 5 stars, which breaks down to 5 stars for protecting passengers during side crashes and 4 stars for frontal and rollover crashes. The Soul comes equipped with a full range of airbags, including front, front seat-mounted side and full-length side-curtain airbags. Other standard safety features include electronic stability control, traction control and antilock brakes with electronic brakeforce distribution and brake assist. In addition, the Soul features Hill-Start Assist Control, which holds the vehicle briefly on inclines when the driver moves his foot from the brake to the gas pedal. Owners find a lot to like about the Kia Soul, starting with its roominess, peppy performance and overall value. The cabin offers plenty of storage spaces, owners say, with enough headroom and legroom for taller passengers. They also like the layout of the controls, which are within easy reach, and they voice numerous positive comments about the Soul's many tech features. In addition, they like the car's performance and handling, calling the Soul a fun vehicle to drive. Several owners say they like the high seating position for the driver, and most do not find problems with visibility out the back. Many owners report excellent gas mileage, thanks to performance tweaks for 2012. Some owners take issue with the Soul's exterior design, finding it a little too unique for their tastes, and others find the ride too harsh. Beyond that, it's hard to find negative owner comments about the Soul. The Soul's biggest draw for many owners remains its overall value, since it delivers styling, fuel economy and good performance all at a reasonable price. What's your take on the 2012 Kia Soul? 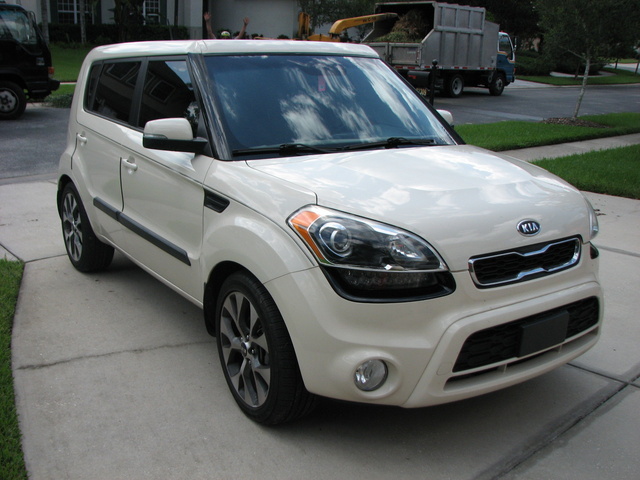 Have you driven a 2012 Kia Soul? My back pads look identical to what I bought for my front ones. Are they the same pads for all 4 wheels or is there a small difference that I'm unaware of. Thx for the help in advance!! AC Sometines Does Not Work. Where Is Antenna Sensor Coil? Kia wont turn over I see people saying replace the antenna sensor coil but I don't know where or what it is?